We love infrastructure. What could be more important than the stuff that keeps us moving, powered, safe, and clean? But infrastructure is often taken for granted, and even though it is all around us and effects our lives constantly, its maintenance or negligence can be an invisible issue to the public. We have worked with several clients to raise the profile of our nation's roads, rails, pipes, ports, airports and aqueducts, and specifically the need to invest in them. Scottie Public Affairs serves as the official communications team for Infrastructure Week, which is led by an esteemed committee of nationally recognized organizations: AFL-CIO, American Society of Civil Engineers, Brookings: Metropolitan Policy Program, Business Roundtable, Building America's Future, National Association of Manufacturers, U.S. Chamber of Commerce, and Value of Water Campaign. The steering committee is joined by hundreds of affiliate groups that all commit to amplify the message about the need to investing in infrastructure during the annual advocacy week. With Scottie Public Affairs writing messaging content and talking points, pitching press, managing website content and social media platforms, project managing video production, purchasing digital advertising, and drafting a daily "tipsheet" for thousands of stakeholders, we were engaged in every element of external-facing communications and coordinating efforts across the diverse steering committee. Importantly, by doing our job well, we allowed other staff to focus on what they did best too. In different capacities, Abigail had worked with the Infrastructure Week since 2013, but in 2018, the advocacy week gained significant momentum. The week's affiliates grew to more than 420 organizations. The number of events held in Washington, D.C. and across the country also grew significantly to more than 150. Impressively, social media impressions skyrocketed from 177 million in 2017 to 275 million impressions on Twitter and Facebook in 2018. There were hundreds of media stories, op-eds, editorials and blogs about Infrastructure Week. Our efforts received coverage in outlets such as the Wall Street Journal, NPR, Washington Post, CNBC, Associated Press, Politico, Bloomberg BNA, C-SPAN, NBC News, The Hill, and in local markets from Atlanta to Pittsburgh to Los Angeles and dozens of cities in between. Our 2018 Infrastructure Week kickoff event was in the gorgeous Union Station in Washington, DC. 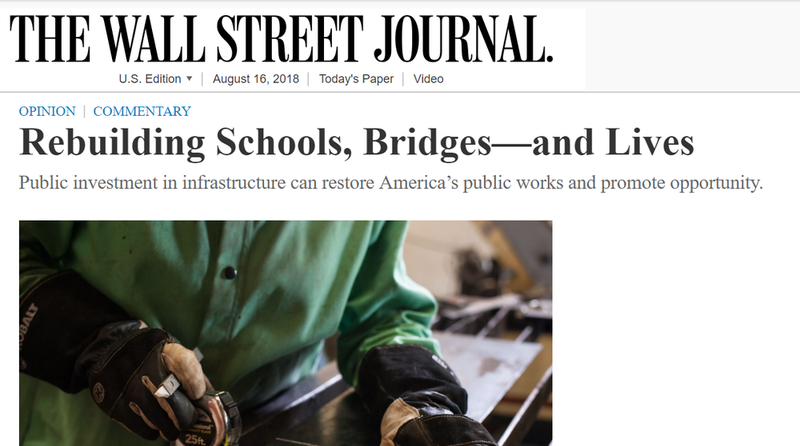 Through our work, our infrastructure-focused clients (in addition to Infrastructure Week) were featured in 60 Minutes, Last Week Tonight, the Washington Post, TIME,and the New York Daily News. Leveraging our relationships, we've been able to shape stories and coverage across print, digital, and broadcast outlets. Wherever there is a good story to tell, we're not afraid to roll up our sleeves and get in the action. We've arranged and staffed editorial board meetings from Colorado to Ohio, worked press conferences in the middle of an active construction site in Texas and Missouri, presented to groups in New York, and toured ports in Pennsylvania. We've commissioned polls, project managed video production, and led website design and builds. We go where our clients need us and we do whatever they need us to do to tell the story they need to be told.